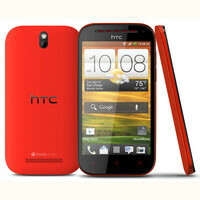 Right on cue, Cricket Wireless added the HTC One SV to its portfolio of mobile phones. For those of you who haven't yet read our thorough review, we're dealing with a decent, LTE-capable Android handset that falls right into the mid-range category. In fact, the One SV is currently the second best smartphone that Cricket has to offer, right after the Samsung Galaxy S III. At the same time, it is priced at a very reasonable $330 (if purchased online), which is a fair price considering what you get in exchange. What the HTC One SV has to offer is a 4.3-inch WVGA display (480 by 800 pixels) made using Super LCD2 technology. The chip powering the device is a fourth-generation Snapdragon running at 1.2GHz paired with 1GB of RAM for seamless multitasking. There's a 5-megapixel camera on its back and a front-facing snapper is placed right next to its earpiece. All of this is enclosed within a body that's only 9.2 millimeters thick, painted in a fiery red color. The HTC One SV can be paired with pre-paid LTE service from Cricket starting at $50 monthly and featuring 1GB of full-speed mobile data. Heavy users have the $70 monthly offer to consider, which includes 5 gigabytes of unlimited data. For more information, head over to Criket's web page by following the link below. Cricket also has the ZTE Engage. The specs are very similar, better in some and worse in others. The Engage's price is just $180. You draw your own conclusions. Btw, at least I am not the one to claim that the SV is better than the iPhone 5.